Minnie’s parents were Robert E. Cofer and Martha Ann Davis, my 3rd great grandparents. Not much is known about them except from records. Both were from Virginia and were married in Norfolk when they were both aged 23. Martha was the third of eleven children and they grew up during the Civil War during 1863 when President Lincoln issued the Emancipation Proclamation and when the Battle of Chancellorsville took place. I have pictures of Martha circa 1918, but nothing of Robert has been found yet. Robert was the fifth of ten children, but his father remarried and had four other children. He also grew up and spent his live in Surry County, Virginia and grew up with slaves in the household. According to Ruby and cousins, Martha went to a finishing girls private school for music and she had her own carriage and two horses. Martha told her granddaughter, Elizabeth Cofer Reed, that she had not dressed herself until she was grown. She also told her that the slaves did not want to leave when they were freed. These are from notes left in Ruby Chapman Wescott’s things. In 1900, the census shows Martha’s occupation as a “Professional Nurse”, at age 59. Impressive. Her previous occupations show her as “Keeping House”. More about her family in my next blog. In 1850, Robert is shown at age 16, with two of his brothers, to be an apprentice to a “carriage maker”, he was listed as a “mechanic” in 1860 at age 20 and in future census records, as being a “wheelwright”. Skilled tradesmen were as valuable to the Confederate army as a musket-toting soldier. A wheelwright was a highly skilled profession combining both woodworking and metal-working skills. After 43 years of marriage, Robert passed away at age 67 of Dysentery which he had for three years before he died. Martha lived until the age of 78 dying of heart disease. They are both buried in Cedar Grove Cemetery, Norfolk City, Virginia. Robert’s parents were Isaac Cofer and Mary C. Jones. Both of whom grew up in Isle of Wight, Virginia. Isaac owned a plantation and many slaves. The first record being when he was aged 24 in 1830 and owned three slaves. He and Mary were married two years prior. By 1840 he had eleven slaves. And, by 1860, he owned fifteen. His Real Estate Value was $3200 and his Personal Estate Value was $8000. In 1861, papers were filed on property of Isaac lost in the Civil War worth $1400. It was his slave, John. There are seven papers in this file with witnesses for Isaac stating John was an actual slave of Isaac, that he died in service, etc. Government paperwork! By 1870, Isaac’s worth had decreased. His Personal Estate Value was $300 and his Real Estate Value was $3000. He died about four years later at age 68 although there is no real proof of his death yet found. I cannot find any record of a certificate or a grave. Interestingly enough, Isaac’s second wife is a Sarah Jones (any relation to the first wife? I do not know… yet). Two of Isaac’s daughter’s marriages are shown to have taken place at “Isaac Cofer’s Residence”. Mary E. married a Confederate Army Captain. Isaac Cofer’s parents were Reverend Joseph Cofer and Jerusha Lancaster (age 15 at the time of their marriage). They too, were slave owners. Jerusha died at age 39 leaving Joseph with ten children ranging from aged five to age twenty-three at the time of her death. Less than a month later, when Isaac was age 41, his father married a second time, to Martha Wrenn. They had three children together. All in all, thirteen children for ‘ole Joseph! Add to that Joseph’s twenty-five slaves and you have quite the plantation I assume. In one of the genealogy message boards, a person is trying to find information on her family stating, “Family history talks about an Aunt Mandy and Uncle Charles Jones who were slaves that were free after the war and were residing with Joseph.”. The below video is of an old grist mill owned by the Wrenn family which stood on Route 677, north of Smithfield. The video is made from scans of a roll of medium format film taken in the late 1960’s with a Yashica Model “D” camera. The mill was demolished in 1989 after a pickup went off the road and crashed into it. The below article was in something I found in my research while writing this blog. I am hoping to get the previous pages as well. Maybe I can convince my cousin, the history major, to make a trip for me and get me copies. Updated 3/11/18- Someone from my Isle of Wight Facebook page owns the book and supplied the missing page 90! Figure 123 – Sampler by Unity A. Delk, dated Sept. 5, 1834; attributed to Isle of Wight County, Virginia. Figure 124 – Sampler by Elizabeth M. Cofer, age sixteen, dated 1834; attributed to Isle of Wight County, Virginia. On the website, http://www.emlis.com/examplarery.htm, I found this which has the exact date of Jerusha’s death! How wonderful it would be to have this! How exciting for me to find this!! Isaac’s half-brother, Thomas Wrenn Cofer, is another fascinating figure. Thomas owned and operated the T.W. Cofer & Co. which produced the Cofer revolver during the War Between the States. It was used by the Army of the Confederacy. You can still purchase these rare guns for as much as $2,500.00 or so. To read more about his patent and see his application and guns, click on Thomas W. Cofer Legacy Believe it or not, after 157 years, his patent papers are still intact. Joseph’s parents were Thomas Cofer and Elizabeth Moody. Ruby states that “Thomas and Elizabeth Cofer gave an acre of land to build the Mills Swamp Baptist Church.” As proven in the 190th Anniversary newspaper article written in Aug 13, 1964 below. It is Elizabeth Moody’s father who I have been able to trace to the American Revolution thus far. His DAR Ancestor # is A079173. “Phillip is the ancestor who assisted in establishing American Independence, while acting in the capacity of Patriot (supplying Provisions for Virginia militia). Although he was too old for military service, he served the county of Isle of Wight, VA as Justice, and was a member of Isle of Wight County, Virginia Court 1750 until 1751. He came from Gloucester County, VA and bought 477 acres in Isle of Wight on 22 Oct 1724. He was one of the first head’s of families in the First Census of the United States. Here is a copy of his will which lists not only his wife and children, but also his slaves by name. If you click on the picture below, it should open in a new window for you to view it in a larger format. Phillip is buried at Arlington National Cemetery, Section 27, Site 1912. Phillip Moody, Sr. is the end of this line so far. Thomas Cofer II’s line continues with his parent’s, Thomas Cofer, Sr. and “Oliff” Olive Ward. They also lived their lives in Isle of Wight, VA. They had nine children, slaves, and land. Thomas Cofer, Sr.’s parents were John Coffer and Jane Bennett. Janes’ father was Richard Bennett, Jr.
John Coffer lived to be 84 years old when he died in 1769. His parents were William Coker and Margaret Cartwright. There used to be a lot of uncertainty that the Coker and Cofer’s were the same families and some thought that they were being confused with each other. Since then, with records and DNA, most genealogists have been able to relate the two. William Cofer’s parents were John Coker and Margaret Allen. John was born in Mapowder Branch, England in 1641. He died in 1720 at age 79 in Lawnes Creek Parrish, Surry County, Virginia. John’s parents were thought to be John Coker and Dorithy (Dorothy) Bishop, but this is not proven at this time. More research needs to be done now that I have reached England. 12 Jul 1665 – William Boddie patents 3350 acres in Isle of Wight at the head of Cypress and Western branches for the transportation of 67 persons, including a John Cocer. (C.P. 476) Boddie, John Bennett. Southside Virginia families. (Baltimore [Maryland]: Genealogical Pub. Co., 1966), 2:84. 1683 – Surry County – John Coker appears on a list of tithables by himself. 20 April 1684 – Surry County – John Coker received a grant of 400 acres on Cypress Swamp, Lower Parish of Surry for the transportation of 8 persons (P.B. 5-371). 1688 – Surry County – John Coker appears on a list of tithables by himself. 1694 – Surry County – John Cocker appears on a list of tithables with 2 tithables, the other being William Cocker, his son (> 16y). 18 Jul 1701 – John Coker is relieved of paying taxes, meaning he has probably reached the age of 60. 1704 – Surry County – John Coker held 900 acres on the rent rolls. 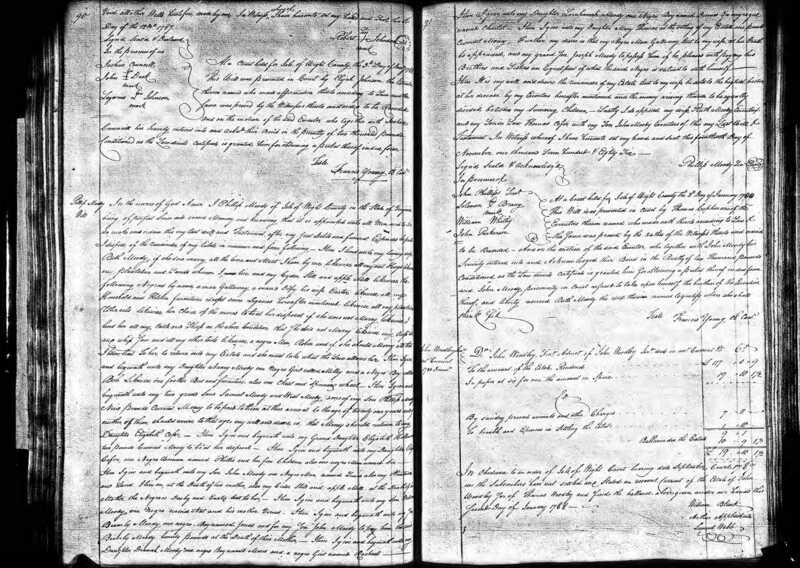 22 May 1711 – Will of John Coker. Names son William Coker, grandson John Coker (son of William), wife Margarette. Witnesses: John Atkinson, John Phillips, Pricilla Coker. [Will Book 1713-1730, p 281] Note: witnesses are the same for wife Margaret’s will.